Sony has started the New Year with something we might soon see more of – a price cut on a top-of-the-line tablet. Today the news broke that Sony has cut the price of the Sony Tablet S by $100, taking it from $499 for the 16GB version and $599 for the 32GB version down to $399 and $499 respectfully. The price cut took affect today, right after it was announced, and is now available through their site and at other retailers. The price cut is not a limited time special, according to Sony. 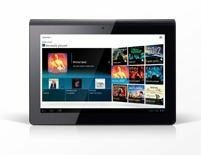 A spokeswoman from the company referred it as “permanent.” Launched in September, the Sony Tablet S has not been on the market for long – which makes this price cut eerily similar to the price cuts that the HP TouchPad (our CP Deal Of The Year) experienced soon before it was discontinued. However the Sony S does have some advantages that the HP TouchPad didn’t have in its stable. Mostly that it runs on Andriod. HP not only discontinued the TouchPad, but also the operating system (WebOS) that it ran on (since then, they have decided to take it open source). Much like the HP TouchPad, the Sony S is a powerful tablet. More powerful than the TouchPad. And much more than the cheap Kindle Fire and B&N Nook Tablets that shook up the market last month. It has a 9.4 inch capacitive multi-touch touchscreen, a 1 GHz dual core processor, 1GB of RAM and two cameras, one .3 MP and the other 5.11 MP. But while the Sony S appears to be a very nice tablet, and the price is more attractive after this price drop – at this point it seems the only tablets that are really selling well are either small, low cost, economy models (and more are on the way)… or the Apple iPad. This price cut puts the Sony Tablet S in between the two. More powerful than the cheap models, less expensive than the iPad. But will shoppers buy at $399, or will it require a bit more of a discount for Sony to get the Sony Tablet S moving off store shelves respectfully? We expect it’s still a little on the high side and that Sony will have to goose sales a bit with another discount on top of the new permanent price. In the end though, you, the shopper, will be the deciding factor.